Sinead Spearing chats to Rune Soup podcast about Old English Medical Remedies; extracting ravens' eyes, the myriad use of gall, hag attacks, the Nine Herbs Charm and more. Download the podcast or listen on YouTube via runesoup.com. You'll be £19.99 closer to your next £10.00 credit when you purchase Old English Medical Remedies. What's this? In 9th century England Bishop Ælfheah the Bald is dabbling with magic. By collecting folk remedies from pagan women he risks his reputation. Yet posterity has been kind, as from the pages of Bald’s book a remedy has been found that cures the superbug MRSA where modern antibiotics have failed. Within a few months of this discovery a whole new area of medical research called Ancientbiotics has been created to discover further applications for these remedies. Yet, what will science make of the elves, hags and nightwalkers which also stalk the pages of Bald's book and its companion piece Lacnunga, urging prescriptions of a very different, unsettling nature. Cures for the 'moon mad' and hysteria are interspersed with directives to drink sheep’s dung and jump across dead men’s graves. 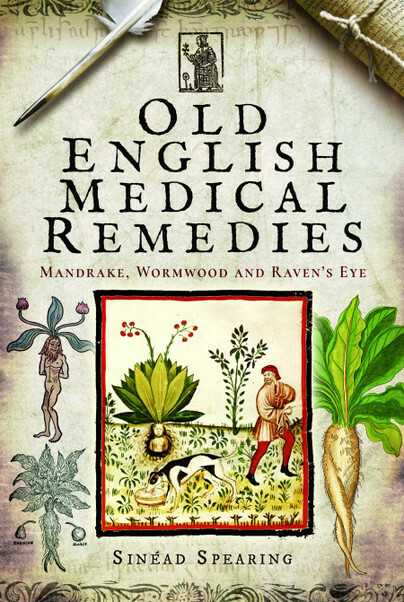 Old English Medical Remedies explores the herbal efficacy of these ancient remedies whilst evaluating the supernatural, magical elements and suggests these provide a powerful psychological narrative revealing an approach to healthcare far more sophisticated than hitherto believed. All the while, the voices of the wise women who created and used these remedies are brought to life, after centuries of demonisation by the Church. If you're interested in how ailments were treated when science was just a seedling, then Old English Medical Remedies by Sinead Spearing is for you. This was not at all what I expected - I thought it would be more like a recipe book than anything else. But I'm so glad I read it anyway, as it was a fascinating account of the life and beliefs of people in the olden days when it comes to medical remedies and healthcare. I learnt a great deal as I realised I had a very limited knowledge of the topic. It will be easier to read for people who are used to more academic history texts, but not inaccessible to a beginner. This book is unlike any other that I have read before, and I was in a medieval medicine class! The author's use of both old and new is masterful and really sheds a light on the fact that old knowledge does not necessarily equate to outdated knowledge. I recommend to anyone interested in medieval medicine and is also interested in how it might be applied to our own time. contains a cure for the superbug MRSA. A curious and interesting book. This book was so interesting! I learnt way more than I thought I would and really enjoyed it all at the same time. This was an interesting book and not what I was expecting. It was a book I enjoyed skimming through picking out remedies that caught my eye and I really need to sit down and read from cover to cover. It is a wonderful history of old fashioned remedies and what they were used for, some being odd and very strange. I love books such as this and I really recommend for readers who look for the strange and unusual. What a wonderful book this was! I enjoy my fiction but I also crave for well documented books filled with interesting facts, research and in depth analysis. This is one of those books that left me captivated by the subject and wanting to know more about it. This is a fascinating read with definitive research on healing dating back to the Druids. I found it very helpful in my own use and went right out to buy my own copy. What a cool book! I am going to buy this. As a writer of historical fiction and a medievalist, this is a must-have for my personal collection. I found this an interesting but heavy read. It describes in a fascinating way the role that women played in early medicine and how it has now been discovered that by reconstructing some of the remedies in a book dated well before 1000 AD they are as effective if not more so in some cases than we currently produce. Spearing takes a fascinating, scholarly look at how we used to treat illness and injury. Blaming demons, wild animals and a vengeful god were often the causes for the illnesses and the cures were often equally horrific – bleeding the patient, attaching leeches, drinking urine and using dolphin skin are only a few of the bizarre “cures” patients were subjected to. We often wax lyrical about the good old days, but the book will have you happy you live in the 21st century. I think this book is a very interesting read. The author uses where possible the original olde English instead of relying on other translations all the time which makes it refreshing. This is a very interesting book, recommended to people who are interested in both ancient remedies and history. This book is not what I was expecting but I love it! When I read it I feel as though I am from another time! As someone who is at the beginning of researching herbal remedies and folklore of this time I was excited to receive a copy of this from NetGalley and the publishers. It was not what I was expecting which was a dictionary or collection of remedies but so much more. It delves into the history of medicine, magic and beliefs of this time in an accessible way. For me it was a perfect resource. An incredibly interesting book that delves into the history of medicine and the new study of ‘ancientbiotics’, Old English Medical Remedies makes an intriguing book and a new discovery - if you’re into this subject, this is a must read book. I’m into natural remedies and ailments and this book has come in handy. It’s not what I was anticipating but it’s was an interesting read nonetheless. A very interesting book on Anglo-Saxon remedies, focused on a surviving 9th-century leech-book (book of remedies). It discusses not just some of the treatments, and their efficacy, but also the outlook that underlay them: a belief that much disease was caused by otherworldly beings. Another fascinating angle is the extent to which superstitions and pagan tradition are reflected in a work compiled in Christian times. A final chapter looks at what can be ascertained about the female healers of the time. Anyone interested in the Anglo-Saxons, traditional healing, or the history of medicine should read this book. A great read for anyone interested in old remedies and the history of why they were so used. I very much enjoyed this book and definitely learnt from reading it. Sinead Spearing's recounting of old writings, codices and manuscripts with her explanation and deciphering of the Old English recipes and actions is interesting and engaging, the research deep and well sourced. For example, one combination of herbs "... stands against pain, it dashes against poison, it has power against three and against thirty, against the hand of a fiend and against noble devices, against the charm of vile creatures..." Sounds like a handy thing to have in my medical kit, you know, just in case of fiends and creatures. But, there is a warning against sampling the cure because it could kill you. Sinéad Spearing is a psychological historian specialising in the research of obscure beliefs. She worked as a professional musician before returning to university to study psychology and philosophy. Following a number of articles published in Journals including those of The British Psychological Society and Mensa, Sinéad began researching the bizarre world of Old English medicine, psychiatry and associated supernatural traditions.